The MDF base of my Darwin is getting a little worn where I keep building experiments on it then ripping them off. I decided to bolt something sacrificial onto it to build upon. I had no more MDF, but I did have some balsa wood so I tried that. It works really well. Above is the X-axis PCB holder. Even with PCL this has a slight tendency to curl up at the ends because it's so long and thin. But with balsa wood, no such problem - it builds perfectly. It works especially well if you run the first layer a little low. This causes the extruder to force the polymer into the grain a bit, giving good adhesion. But the balsa is so weak that it's still easy to separate the built part (though some bits of balsa come away with the part, they are simple to clean off with your fingernail). I made a little aluminium template to cut the balsa round with a scalpel and to act as a jig for the holes through which I bolt it to the base. And, as it gets a bit tatty, you can double its life by turning it over, of course. In addition, we have stepper-driver boards for it that allow RepRap to use much less expensive and more easy to obtain stepper motors than the current ones. We shall do a release of the entire RepRap system (hardware, firmware, and software) shortly that will be a stable platform from which people can take the current PIC microcontrollers forward if they wish. 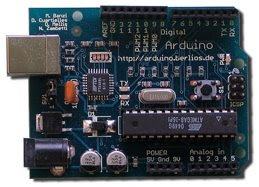 We will then do a subsequent release with identical host software, but with the Arduino electronics and firmware. This will form the basis of our next set of developments. Buoyed up by yesterday's success, today I set my Darwin making the screw-drive holder from the extruder. It took about three hours, so I think I need to make some speedups, but it came out well. There were a few PCL strings from the extruder in-air movements, but a slash of the scalpel did for those. Again, I ran a drill by hand through the holes to clean them up. I didn't even have to change any of the settings to get it to work the same as the old one. While it was printing, I soldered up a quick opto-switch PCB. Then I took the bracket off the build bed and ran a drill bit by hand down a couple of the holes to clean them up. I bolted the assembly together. That extruder now has speed feedback. Job done. I've upgraded to the latest code (SVN #1428 at time of writing), and rediscovered why we're turning the extruder on and off a lot. In this video we see the extruder nozzle go to my hand-made Meccano nose-wiper, nicely clean itself, then shoot off on the Y axis at X=0. After turning on its extruder feed, the nozzle builds up a nice thread of goopy plastic en route to where it really should be printing, and wipes it off on the workpiece. Charming. Finally, after printing out a Y motor bracket looped with festive decorations, the RepRap software drove the Z axis back to zero, pushing the workpiece through the cooling fan and kindly lowered it again to show off the damage. Did someone say holiday? Oh, good. 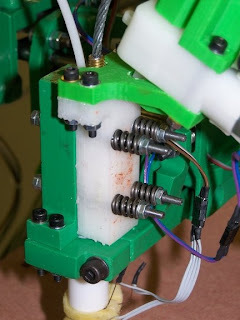 RepRap doctor blade in operation from Adrian Bowyer on Vimeo. The doctor blade I blogged below is a sharp V notch which you run the extrude head over once to clean it. This works really well, but the extruded junk builds up in the V. So this little lever, nudged by the extrude head before it cleans itself, cleans out the last bit of extrude junk. As you can see, this one is made from bits of scrap plastic. We'll ad an RP version to the RepRap design soon. 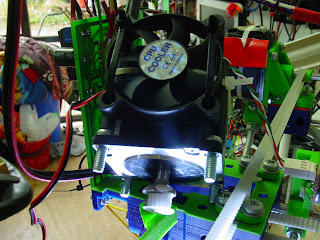 I've replaced the X belt gear (hand-moulded perfectly first time) and strapped an old CPU fan onto the stepper. That takes care of cooling the X axis. Following that repair, I successfully printed a modified Y Motor Coupling and fitted it to the Darwin RepRap. Using the new part, I then printed another identical coupling - so we know it lasts long enough to at least replicate itself. Note that the end away from the motor is somewhat thicker and there is a ridge running between the two grub screw holes. Here is one propped up by the working coupling on a pair of tweezers. Temperature graphs show motor temperatures halting below 45C, so the coupling issues seem solved. After looking at the cool stuff nophead is doing, and stealing an idea from Ed, I have improved the nozzle wiping on my RepRap considerably. The picture shows a doctor blade cut with scissors from brass shim. 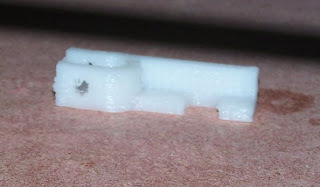 It has a V notch that the extruder uses to discard excess extrudate. I have upgraded the Java code in the repository to use this type of wiper, which works better than the previous toothbrush-wiper blogged a few days ago. Tricks: make the V angle very acute, and curl the profile down slightly so it comes up to meet the nozzle as the nozzle moves over it. Also take care to align the nozzle with the very centre of the notch when it does the wipe. We still nead a way to clean the cleaner, I think. As you can see, lengths of extrudate build up in the notch and are going to cause trouble eventually. Well, it appears I've been running at speed through good grace & fortune. After doing the graph in the previous post, my X axis belt gear disintegrated. It got too hot. Why pick now? Because the fan I put over the Y axis motor was previously used to cool the extruder motor. That didn't need cooling in the end, so I relocated the fan. Half of the exhaust from the extruder motor cooling fan (installed because it has a CAPA bracket) blew directly at the X axis motor - and kept it below CAPA melting point. Igor move fan. Igor's gear melt. So, now I have to strip the X motor bracket, make a new X motor gear, and fit a fan to the X motor before continuing. Bugger, as we say in New Zealand. Positive outlook: I've shown fans do stop CAPA RepRap parts from melting, and there is still cold beer in the fridge. It's a RepRap day. I like RepRap days - courtesy of Catalyst IT I get one a week. If anybody wants to sponsor me for another day a week I'd love to hear from you! So following on from the saga of the disintegrating Y Motor coupling, I printed out another even denser PLA Y Motor Coupling with yet more plastic in the stressed areas. I can't really continue replication with a straight face without resolving this one way or the other. At 47C it was showing signs of de-laminating at the 8mm shaft end and the 6.5mm motor shaft started slipping. 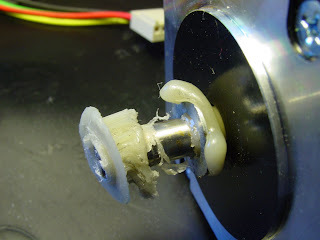 I tensioned it up once more, but as the temperature hit 60C the PLA softened and was no longer sound enough to hold the motor shaft under tension from the grub. The grub moved, slackened, and the coupling failed to grip the motor shaft once more, this time allowing the shaft to rotate freely. Ugly. 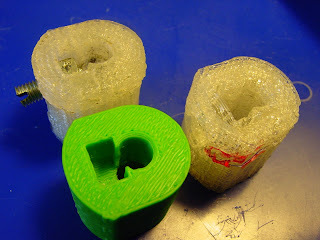 The group photo shows one pristine ABS part in fetching green, one less dense PLA part with a split marked in red, and one showing how the nut & grub go a-wandering when the plastic warms up. 1. 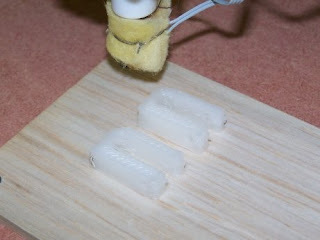 Make the coupling from a higher MP plastic. 2. 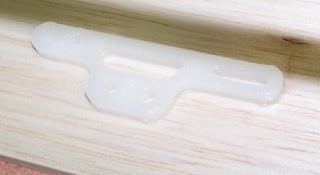 Cast the coupling from epoxy in a reprap'd mould. 3. Find motors that run cooler. 4. Cool the coupling with a fan or similar. 5. Make the coupling from non-fabricated materials. Note that with the X motor we're not having melting problems. The CAPA gear sits directly on the shaft at 51C and is not melting. It's just the Y axis with the problem, probably due to the high load that motor experiences. So, having a small 12V cooling fan handy made the selection much easier. Number 4 please, Bob! A few cable ties later and some impromptu ducting made from - yes, duct tape, we have the following monstrosity. If my head had been functioning properly this ducting would be under the cable ties, not stuck on top of it but hey. So I've thickened up the coupling design some more, made it taper out, away from the motor end where space is tight, and started printing it while monitoring the motor temperature. So far the Y motor has reached a maximum temperature of 42C compared with the uncooled X casing at 69C, which may be good enough. 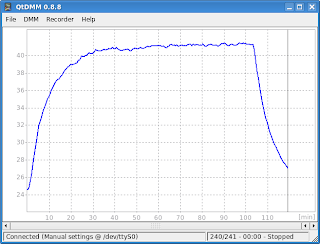 To give more control over any hysteresis in the extruder I've committed code and two new parameters to the properties. I’ve been working a lot on the RepRap code lately and I recently got it to the point where segment pausing is drastically reduced. 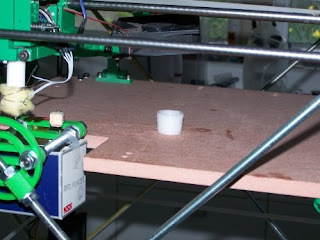 This RepRap is driven with Arduino based electronics running a GCode interpreter firmware. Woot! Segment Pausing Fix from Zach 'Iowa' Hoeken on Vimeo. Update: here's a video from Vik showing the current segment pausing with the PIC based firmware. RepRap Deposition Showing Pauses Between Segments from Vik Olliver on Vimeo. Ed and I have been experimenting with various strategies to improve build quality. One problem is bits of polymer sticking to the head and then dropping onto the build and messing it up. Another is the fact that if you run the acorn-nut nozzle (left above) too close to the surface it smears the molten polymer all over itself, and then re-deposits some of that later where you don't want it. I made up the nozzle on the right. It is 1.5 mm diameter at the end, with an 0.5 mm diameter through hole. With this in place of the acorn nut, you can run the nozzle over the surface to sweep it flat without pushing the polymer where you don't want it. 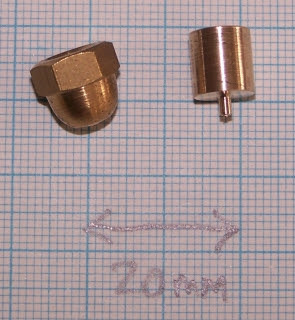 It is a bit more complicated to make than the acorn-nut nozzle (which just needs you to drill one small hole in an off-the-shelf part, of course). But it works significantly better. 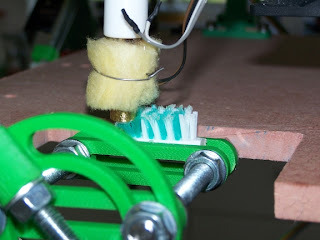 To clean the new nozzle, we've added a toothbrush along with a nose-wipe cycle to the host software. This keeps the crud off the nozzle by wiping it back and forth at the start of each layer. They should be fairly representative as my latest build is now pretty much faithful to the latest design. One point of interest is that the heater, and the inside of the heater barrel, are quite a bit hotter than the nozzle, where the thermistor is controlling the temperature. That begs the question of what the actual temperature of the extruded filament is, as that is the important thing to control. I seem to be getting similar results with temperatures that are 20°C below the values I was using with my single piece nozzle. That would suggest that the filament exits at pretty much the temperature of the heater barrel rather than the nozzle. 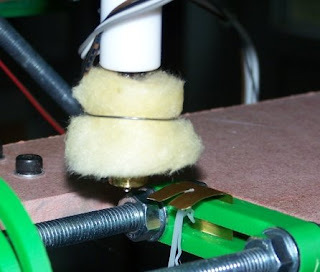 Mounting the thermistor on the barrel rather than the acorn nut is probably a better option. Fed up with us pesky developers changing the preferences file all the time, so yours hasn't got the right things in? Now, if you have debugging turned on, it'll compare your file with the distribution one when the host software is run and report the differences. I know. Debug is one of the preferences... And, if you have it switched off it doesn't do the check as soon as you switch it on. But it does do it the next time you start the system. I've bought some "ball chain" or "beaded belt" from the local Mitre 10 hardware store for NZ$6.95 per metre. 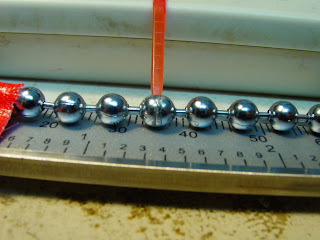 The balls on it are 4.60mm in diameter and have 1.80mm exposed length bars between them. I have plastic beaded belt of the same dimensions, so this is likely to be some kind of standard. Investigations continue, do clue us in. 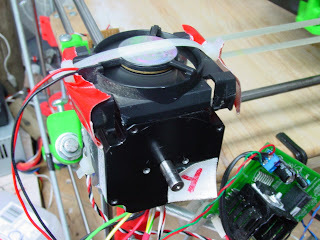 I've designed a pulley (shown left) that can be fabricated on a RepRap - and made one. After a mechanical test, Adrian ran 4 off on the Strat. Note: Make one with a rim that lifts off in the future so I can fit the damn belt without resorting to violence. Here is the video below showing them in operation. Note that the orange pulley under the bed in the lower left corner of the frame is rotating and that the old drive belt is not fitted. The red temporary join is a cable tie and is obviously not going to go smoothly around the corners. The chain is made from chromed brass, by the way. To join the ends of the loop, I filed down the two terminating balls on the chain into approximate halves (measured with a badly-calibrated Mk I eyechrometer) while holding them in medical clamps. Then I held the clamps in a couple of angled vices so that the halves fitted together properly, finally soldering them together with a 30W soldering iron and highly toxic lead solder (yum). Better ideas welcomed! The joined chain is robust enough to turn the whole Z axis assembly with some enthusiasm. When I build the next RepRap the gears will go in the usual place. 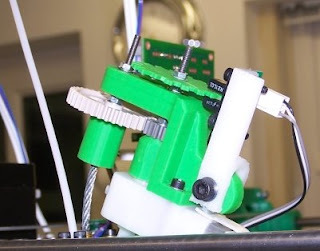 The guys at Aligni kindly offer to support open-source projects like RepRap for free. Their software manages a bill of materials for a project along with links to suppliers. 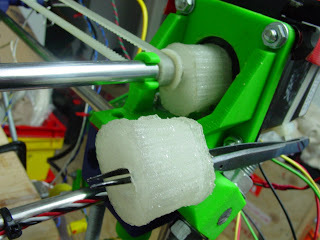 Zach has set up a similar system at parts.reprap.org that works very well, so the RepRap team will stick with that. But if you'd like to experiment with the Aligni system and the RepRap data from our parts database we (and they) would love to hear how you get on. I had an idea in the bath. To feed the filament, all we need are two ratcheted holes and a solenoid to drive them apart and bring them together. No gears or rotary bearings would be required, and we'd have absolute control over filament driving. 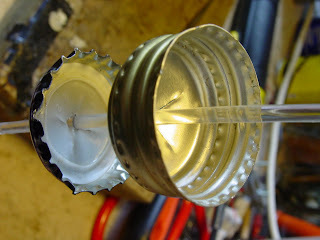 I built this working prototype from two bottle tops, one aluminium and one steel 'cos that's what I could find without having to dive into the kitchen rubbish bag. I drilled a central 2.5mm hole through in the direction I wanted the filament to go (out the top) and cut 4 radial slots out of the hole with a sharp knife about 7mm long. The aluminium one is far too soft. Move them together, filament moves forward. 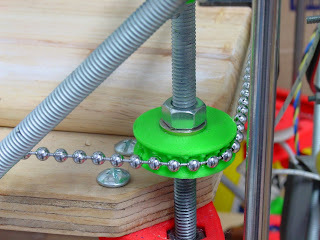 Move them apart or let a compression spring do it for you, filament stays put. We can change the distance driven, change the timing, and vary the power of the solenoid to change driving pressures. A spring or split washer on top might help even things out. A similar system might step beaded belts. I shall simultaneously celebrate this idea and obtain another ratcheting component.